Starting GPS Co-ordinates: N51 11' 70" W000 77' 10"
Finishing GPS Co-ordinates: N51 14' 00" W000 77' 60"
This short greenlane does not lack in difficulty despite its brevity! Little more than a very steep, rutted hill climb on a sand and gravel surface, we drove the byway from its eastern end just to the north-west of the village of Grayshott. Turning off of Whitmore Vale, the byway climbs up the side of the valley, up a hill called Whitmore Hanger. In places some holly bushes protrude into the lane and will cause a bit of a squeal as the paintwork protests. Once the climb is negotiated and the trail flattens out, the lane turns onto a more westward track and eventually ends via the seemingly inevitable driveway on Hammer Lane. 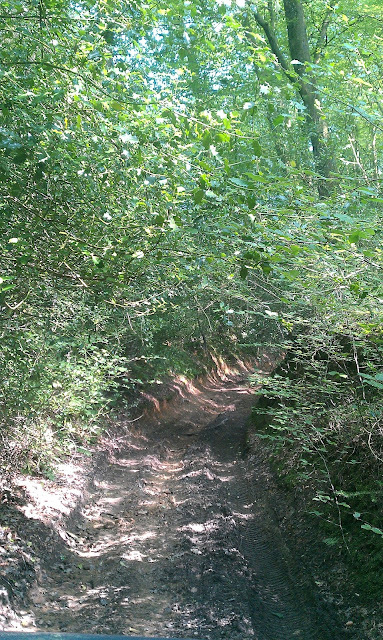 This byway is also featured in Land Rover Owner International magazine's November 2012 issue as byway number 8. Ran this west to east (uphill to downhill 22/12/2013), seemed a very difficult lane, best saved for the brave - although perhaps I'm going soft. It has become very rutted causing alarming roll/leaning angle which must've been the max or exceeded what my 110 can do. Surface was also deep in leaves, over slippery mud, so good tyres are a must. Heart in the throat time. Please just walk it ALL first - in case you over commit like I probably did i.e. we did the first ruts, then had to do the 2nd ruts, as turning around and going back up seemed probably too hard. It's people like yourself (unfortunately anonymous) that make this site what it is! Thank you so much for the update: with over 300 lanes thus far (and with circa 50 we have yet to visit) we cannot possibly keep track of every change to every byway, and as such we rely on user input as far as we can. Therefore, we are greatly appreciative of your contribution. Thank you! As of end of December 2013 this lane had a temporary TRO put on it. Since then metal gates have gone in. I feel this lane has been lost. It's a shame because it was a nice lane if driven responsibly. I don't see it re-opening anytime soon. Indeed: according to Hampshire CC, 'A section of this route will be temporarily closed between 21/10/13 and 21/05/14. For further information please visit www.hants.gov.uk/publicnotices'. On following that link and searching for 'Grayshott' the following .pdf comes up 'http://www3.hants.gov.uk/pnadetail?noticeUID=2827', which states the byway is closed from '22 April 2014 for a period of twelve months or until the route is considered safe, whichever is sooner.'. As you say, not looking great. We shall see what (if anything) happens. Thank you for the information, Graham. I shall voice my objections in line with your post. May I recommend others do the same!